I’m a huge fan of the quarterly print magazine Uppercase; participating in the challenges and prompts for each issue stretches my creative practice in new directions, and allows me to discover and connect with a really supportive community of artists & makers. 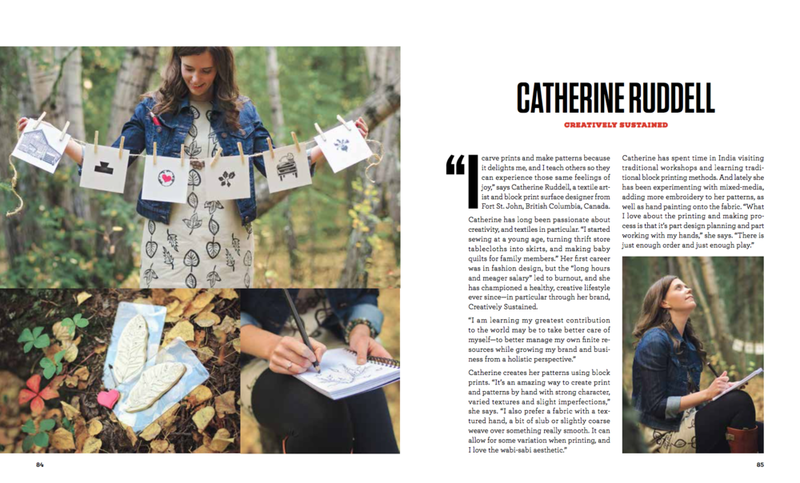 I was over the moon to be featured in a recently published book called Print/Makers - you can order your own copy here! I was extremely honored to be the recipient of the Cultural Award my hometown in April 2018. Each year this award recognizes an individual who demonstrates excellence in an artistic field, increases artistic and cultural opportunities within the community, and encourages local residents to reach and expand their potential through culture. Each year, the Two Rivers Gallery develops and circulates an exhibition throughout the Regional District of Fraser-Fort George. This year’s exhibition, titled Hold Fast / Let Go: Reflections on Home & Family, featured three pieces of my surface design work, alongside work from artists Frances Gobbi & Mo Hamilton.